The University of Wisconsin (UW) Hospital and Clinics recently achieved Stage 7 status, the highest designation awarded by HIMSS Analytics, a not-for-profit subsidiary of HIMSS. It was the first academic medical center in the country to achieve this designation. Stage 7 hospitals are defined as those that deliver patient care without the use of paper charts; are able to share patient information by sending secure standardized summary record transactions to other care providers; use their vast database of clinical information to drive improved care delivery performance, patient safety clinical decision support, and outcomes using business intelligence solutions; and are best-practice examples of how to implement sophisticated EMR environments that fully engage their clinicians. Two other hospital systems also achieved the Stage 7 award in January: Citizens Memorial Hospital in Bolivar, Mo., and Stanford Hospital & Clinics in Palo Alto, Calif. And as of January, 39 hospitals nationwide have achieved Stage 7. UW Hospital and Clinics, a 493-bed tertiary care hospital and regional referral center, is home to the American Family Children’s Hospital. The hospital’s community clinic locations provide primary and specialty care to patients. Mike Sauk, vice president and chief information officer for UW Hospital and Clinics, received a phone call from UW’s liaison at Epic, who had reviewed their case and said he believed the hospital system to be at Stage 7. That call inspired Sauk to contact HIMSS Analytics to request commencing the validation process, which consists of a site visit conducted by a HIMSS Analytics executive and two independent former or current chief information officers to ensure an unbiased evaluation. The team visits a representative hospital that has the same EMR applications and clinical utilization of those applications running in all facilities. UW Hospital and Clinics’ medical records department was the key to achieving the Stage 7 designation, according to Sauk. 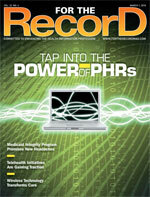 Their paper medical records were replaced with Epic’s coding and chart tracking modules that integrate efficiently with the hospital’s computer system. UW was also the first hospital site for Epic’s anesthesia module. It now has electronic perioperative and postoperative patient medical records, from a patient’s arrival to discharge. Capital funding was used to finance the four-year Stage 7 achievement project of converting the hospital system to a paperless operation. “UW Hospital and Clinics decided four years ago that EMR was more beneficial for patient safety and other reasons,” says Sauk. The organization is now developing metrics to measure the effects of the EMR on patient safety and medication. Sauk notes that they have been able to reallocate nursing resources, and a definite effect has been realized on transportation costs. The costs related to transporting medical records have been reduced by approximately 60% since the hospital switched to an EMR. Also, 16 full-time medical records employees were reassigned to other jobs in other departments as a result of the Stage 7 achievement. HIMSS Analytics developed the EMR Adoption Model in 2005 as a way to evaluate the progress and impact of EMRs for hospitals listed in the HIMSS Analytics Database. Hospitals can track their progress in completing the eight stages (0-7) and review the implementation and utilization of IT applications. For more information, visit www.himssanalytics.org/hc_providers/stage7hospitals.asp.